BlockTile's outdoor pickleball court floors are high-performance court systems built for residential backyards and/or general outdoor use. This Pickleball Court Kit is assembled with our Perforated (Drain) tile, meaning it can withstand any weather condition such as snow, heat, rain, and ice (walk with caution). The size of the full court kit is 26'5" x 52'5" since each tile measures at 12 in. x 12 in. x ½" thick and each edge is 12" x 2 ½" x ½" thick. These tiles are engineered with high-impact polypropylene plastic, purposely designed to be inflexible to create a firm, flat, and uniform game court. This also makes the tiles rigid and sufficiently strong enough to support heavy weights such as cars, without harming the tiles. ModuTile offers a variety of color combinations; so you could have the Pickleball court made just for you! 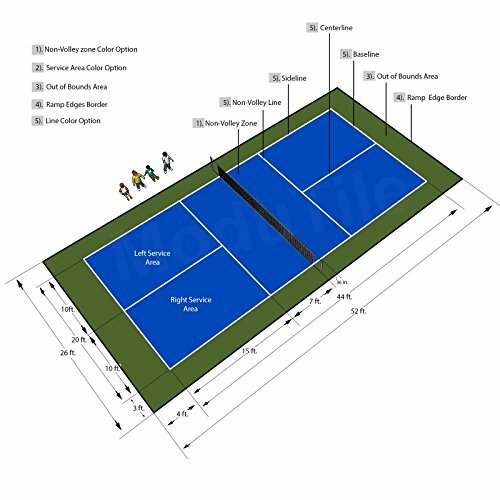 *Pickleball court lines are painted based on the USA Pickleball Association (USAPA) regulations. If you have any questions about this product by BlockTile, contact us by completing and submitting the form below. If you are looking for a specif part number, please include it with your message.